This article won second place in Albany Herald’s Sixth Annual Southwest Georgia Fiction Writing Contest. It was updated for the 2009 Christmas Eve Service at Jefferson FBC. The cold wind could be felt pushing its way through the cracks of the oak wood floor. Sometimes it was brisk enough to flicker the flames that rose in the fireplace of the family room, Carrie Sue’s favorite room. Carrie Sue Reynolds, age ten, would sit for hours watching as whole logs were transformed into hot coals. The fire seemed to hypnotize her. She loved the fireplace so much that she even volunteered for a job nobody else in a family of seven wanted, taking out the ashes in the evening and starting up a new fire in the morning. Some nights she even curled up on a rug in front of the fire and slept until the next morning. Being a light sleeper, she awoke to the distant sound of the whistle from the steam locomotive of the Southern Railway Company that passed through Lula promptly at 6:00 a.m. Even in the summer when there was no fire to light, she would get up at the sound of the train whistle. Sometimes she even ran down to the crossing to watch as the train rolled by headed to other stops along its route: Gillsville, Maysville, Harmony Grove, Nicholson, Center, and Athens, places that seemed a world away for Carrie Sue, who rarely left home. Carrie’s brother Nathan did most of the wood chopping. He also brought the wood inside and stacked it on the hearth. He hated his job just as much as Carrie Sue loved hers. He was convinced if everybody in the family took a turn of chopping and toting wood they would stay a lot warmer and spend a lot less time complaining about the cold. In the Reynolds family, complaining was as much a part of the family routine as milking the cows before the sun rose. The boys complained about having to share a bed. Carrie Sue complained about being the only girl. Their father complained about never having enough money to provide for his family, especially at Christmas. Their mother complained about having to listen to everyone else complain. Carrie Sue found out how important money was to the family the day she turned ten, which was just a week before Christmas. Her mother baked a birthday cake and threw a party outside under the oak tree. Carrie Sue and two of her friends took turns swinging on a tire swing her father had hung from the huge oak tree as her birthday present. In addition to the swing, Carrie’s father gave her a shiny nickel. It was the first coin he’d ever given Carrie Sue. The day after her birthday, Carrie Sue and her friend Beth were walking the railroad tracks looking for some of her pin creations. Her brother Justin had shown Carrie Sue how to place a couple of straight pins on the track in a crisscross pattern. The pressure of the train would press the pins together and make them look like a tiny pair of scissors. She had made other clever designs from the pins as well– a house, a stick man, and a bug– all magically transformed by the pressure of the train’s steel rollers pressing on the rail. As they placed more pins on the rail, Carrie Sue felt the nickel in the bottom of her pant’s pocket. The nickel could have purchased several sticks of licorice at Millard’s Crossroads Store but she was more interested in seeing what “that man’s face” would look like after the train ran over it. She placed her nickel on the track and waited anxiously until the next morning. She got her nickel’s worth of excitement when she ran to the tracks to find her nickel fattened to the size of a quarter. But her joy quickly turned to deep regret when she showed the coin to her father. Her father, Wayne yelled and screamed and told her how hard money was to come by and that she should know better than to destroy it. He made her go out in the yard and break off a switch from the Chinaberry tree that grew by the back porch. Wayne Reynolds often carried his discipline too far, causing his children to have conflicted feelings; they loved him but they were also very afraid of him, especially when he was drinking. Carrie Sue’s whipping had as much to do with her wasting the nickel as it did with how she wasted it. The railroad had once been a friend to her family but her father was disabled from an accident that happened while working with the railroad. He had worked as a brakeman, a dangerous job that sometimes required him to ride on the top of moving freight cars. One day he slipped between the cars and the train severed his leg. He was fortunate to have survived. Instead of being grateful for life, Wayne lost his self-respect. He didn’t feel like a man anymore. “When a man can’t work,” he’d often say to the family, “he ain’t worth nothing.”  The anger about the incident burned within him. The hot coals he kept in his gut were as real as those Carrie Sue stoked in the fireplace. Carrie Sue didn’t understand all of that. She just knew that her daddy was mad about the flattened nickel and that her legs ached from the stripes he left on them. Carrie Sue didn’t understand why her father drank liquor, either. She and her brothers just knew that when he started drinking, they’d better stay out of his way. As poor as the Reynolds family was, Wayne always seemed to find enough money to purchase liquor. It was the only thing he’d found to escape the pain of his troubled soul. Two days before Christmas, the temperature had dropped considerably. The family gathered in the family room to stay warm. Carrie Sue’s mother, Virginia sat in the rocking chair crocheting her last Christmas gift. She was a quiet woman but strong. Even though she never stood her ground with her husband, she was the emotional stability for the family. The children held their breath when they heard the 1924 Model TT Pickup roll into the yard. The closer it got to Christmas Day, the more their father drank. He usually stayed drunk from Christmas Eve till New Year’s Day. As he slammed the door of the truck, they heard him muttering something about the railroad. They heard his boot touch the first step, followed by the unique sound of his prosthesis hitting the next step, then the sounds of his uneven stride across the porch to the screen door. As he opened the door he began hollering for Virginia. Carrie Sue hid under the bed. The boys put away their checkers and hid in the closet. Wayne entered the house and yelled, “Virginia, where’s my supper? You ain’t cooked me no supper in two days. He walked into the family room. Virginia began putting away her crochet. “Wayne, we ate supper three hours ago,” she said. “You talking back to me, woman?” he asked. With that response, Wayne slapped his wife. From under the bed Carrie Sue saw her mother drop to her knees. “Get up, woman! You ain’t fit to be no one’s wife,” he said. With that, Wayne Reynolds took off his ring and threw it into the fire too, as he turned to walk out the door. From under the bed Carrie Sue watched as the flames flickered from the wind created by the draft as her father opened the door to leave the house. He stumbled down the steps and out to his truck. He drove away as Virginia cried, slumped over in her rocker. Virginia knew her child had a point but she was not about to become a punching bag for a drunk. Something had to change but she didn’t know what to do. She did the only thing she felt she could do– she prayed. She prayed for strength. She prayed for guidance. She prayed for her family. Carrie Sue curled up on the rug in front of the fire that night. She had once wondered how Santa came down a chimney filled with smoke and ash. Her innocence was gone now, replaced by the realities of life. All she could think about were her parent’s rings in the fire. When the whistle of the train blew the next morning, Carrie Sue rose and collected the ashes into a bucket and emptied them in the garden as usual. She took a stick and sorted through the ashes for the rings. She found her father’s ring first, glowing red hot, then her mother’s. Carrie Sue expected the rings to be destroyed. Finding them intact was a surprise and it gave her hope. Perhaps it was an omen that her parents’ marriage could be salvaged as well. 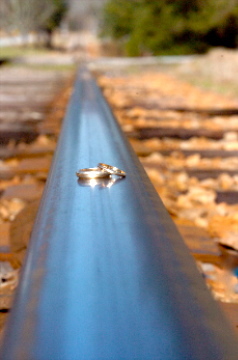 She put the rings into some water to cool them down and then she placed them into her pocket and ran down to the tracks. The train came later on Saturdays than the other days and stopped at the Lula Depot to take on supplies and to deliver supplies and mail. As she waked to the tracks, she remembered something the preacher had said the previous Sunday about how a man should leave his father and mother and cleave unto his wife and they shall be one flesh. (Genesis 2:24) KJV The preacher said that a husband and a wife were supposed to love one another and stay married as long as they lived. Carrie Sue didn’t know much about divorce. She didn’t even know anyone that was divorced. But she knew her family couldn’t stay together if something didn’t change. She had an idea. It was risky, though. Carrie Sue remembered her whipping for placing a nickel on the track. Even so, she believed her idea was worth the risk. She reached into her pocket and pulled out her parent’s rings and placed them on the rail, one overlapping the other. Then she sat and waited. She watched the train as it came around the bend, headed toward Gillsville, slowly building speed. She counted the cars, fifteen plus the caboose. She waved at the man in the caboose and then ran to the tracks. The rings, which lay just a few feet off the rail, were now meshed into one. “Perfect,” she thought. She placed them in her pocket and ran back home. At home, she smelled bacon cooking and coffee brewing. Her siblings were coming back from doing their chores. She rekindled the fire and then she pitched the meshed rings back into the flickering flames. “Breakfast is ready,” yelled Virginia. To the surprise of the children, their father came in from the bedroom. He’d come home sometime early that morning. He was quiet and hungry. Virginia asked Kyle, the oldest, to pray. He thanked God for the food but didn’t venture to address God about their family problems. After the prayer there was no conversation except what was necessary. “Will you please pass the biscuits?” asked Bart. “May I have more grits?” asked Justin. Carrie Sue was the first to finish her meal. “May I be excused?” she asked. Just a minute,” her father said. “I’ve got something to say. I understand I threw your mother’s ring and my ring into the fire last night. That was a mistake. I shouldn’t have done it. I am sorry for what happened. Carrie Sue, do you think you could fish those rings out of the ashes for us? “I don’t know, Daddy,” she said. “I don’t mind looking but I’d really like it if you’d come help me.” After they finished eating, they got up from the table and went to search through the coals Carrie Sue had poured out to the garden. After finding none, Carrie Sue said with some guilt, “Maybe they are still in the fire. They used a shovel and bucket to remove the remaining coals. They carried the hot coals outside and poured them into an old screen. Wayne shook the screen as if he were a prospector panning for gold, which is really what he was doing. After a few shakes, he looked closer at the red glowing rings left on the screen. Virginia didn’t know but she didn’t allow the moment to pass without putting a good spin on it. The words of his wife and his daughter melted Wayne’s heart. He took Carrie Sue out to his woodworking shop and they made a small stand to mount the linking rings and they placed them on the mantel over the fireplace amidst the nativity scene. Later that morning, Wayne got in his pickup and drove into town to find the preacher. The preacher took him to the doctor and they developed a plan to help keep Wayne sober. It was Christmas Eve but for Virginia and the children, Wayne’s admission of his drinking problem and his desire to get help was the best Christmas gift they could have received. That night, Carrie Sue curled up in front of the fire. She looked up at the linking rings on the mantel beside the nativity scene and she smiled. Just as the nativity scene reminded her of God’s unconditional love through his son Jesus, perhaps those linking rings would remind her parents of the kind of love they should always have for one another. As she closed her eyes and said her prayers that Christmas Eve night, this was all that Carrie Sue had on her mind. It was really all she wanted for Christmas, to be loved by her parents and for her parents to love one another. The railroad had taken a lot from their family. Now, with God’s help, maybe it was giving something back through the rings of fire. On that Christmas Eve, so many years ago, Carrie Sue pondered all of this in her heart.